Oval Coelogyne is a small sized, warm to cool growing orchid	found on trees or rocks. Pseudobulbs are 8-13 cm apart on rhizome, not lucid when dried, nearly cylindric, 3-6 cm x 6-8 mm, with 2 leaves at tip and 2 sheaths at base. Leaves are erect, narrowlly elliptic, pointed to long-pointed, gradually narrowing below into the elongate, stalk base. The plant blooms in the summer through winter on a slender, 12 cm long, few flowered inflorescence arising on a mature pseudobulb with deciduous floral bracts and successive opening, fragrant flowers. Flowers are greenish yellow, with purplish red stripes on lip. Sepals oblong-lanceolate, about 20 x 5-6 mm. Petals are threadlike or narrowly linear, nearly as long as sepals, about 1 mm wide. 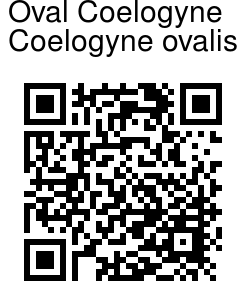 Lip is suboblong-ovate, about 2 x 1.5 cm, 3-lobed. Lateral petals are erect, nearly ovate, mid-lobe elliptic, about 1.0 x 0.9 cm, frilly at margin. Callus with 3 longitudinal lamellae, of which purple inner 2 extending from its middle or near apex to base of disk, median lamella indistinct, sometimes a further 2 much shorter lamellae outside others on mid-lobe. Column slightly arching, ca. 13 mm, both sides with wings; wings widened toward column apex, apex obtuse; anther about 2.5 mm. 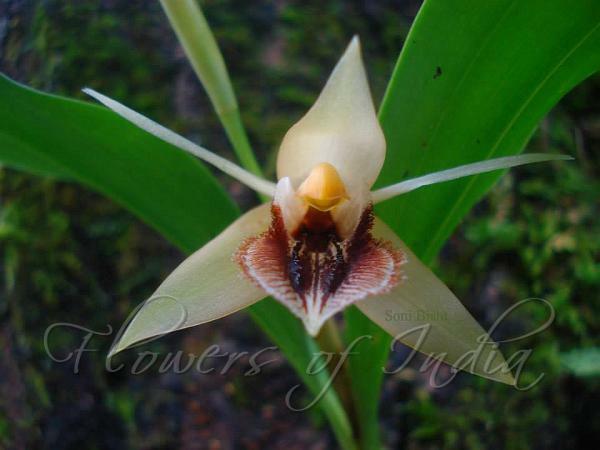 Oval Coelogyne is found in the Himalayas, from Uttarakhand to Bhutan, S.E. Tibet, at altitudes of 1300-1700 m.